Last Friday, I was included in a delightful lunch at the Hayes Street Grill in honor of Laura Shapiro and the publication of her recent book SOMETHING FROM THE OVEN, REINVENTING DINNER IN 1950s AMERICA (Viking). I love Laura, she is a great writer; and the luncheon was very special. Here is my interpretation of the salmon we were served. Of course, it was grilled at Hayes Street; however, I have made it simpler by cooking the fish gently in a non-stick pan. Be sure to get SOMETHING FROM THE OVEN by Laura Shapiro! Trim the beets of their greens leaving a inch of stems. Coat them in olive oil, wrap in foil, and bake in a 400 degree oven for 45 minutes, until tender when pierced with a fork. Put the potatoes in a saucepan with cold water and bring to a boil. After 20 minutes begin to test the potatoes by piercing them with a fork. When they are tender, drain, and shake out any excess moisture. Cut the asparagus on the diagonal into 1-inch pieces, and drop them into boiling salted water. Cook about 7 minutes, until tender. Rinse under cold water. 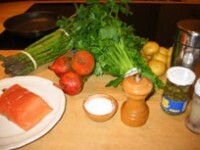 To make the salsa verde, into the container of the blender put the capers, anchovies, and parsley. With the machine running, add enough olive oil to make the mixture liquid. Season with salt and pepper. Put the cooked beets, potatoes, asparagus, with the lettuces in a bowl. Coat with a mixture of olive oil, vinegar, salt and pepper. 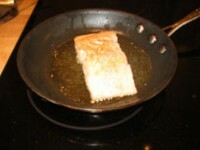 Lightly saute the fish in a non-stick pan in a little oil. 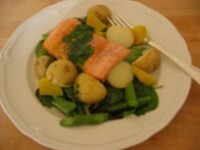 Place the salad and vegetables on a dinner plate, put the fish over, spoon over some of the salsa verde, and serve.